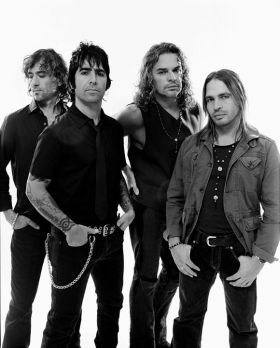 Maná, an iconic Mexican rock band with a profound social and environmental consciousness, will be honored as the Latin Recording Academy's 2018 Person of the Year in Las Vegas on November 14. New York - Maná will be honored as Person of the Year 2018 by the Latin Recording Academy, and Fher Olvera, lead vocalist of the influential Mexican rock band, can't help but recall its beginnings "in a little truck," as they say, chopping wood and carrying water. "The band Maná started from way, way down," Fher told The Associated Press in an interview from his house in Guadalajara, Jalisco, Mexico. "Everything that happens in our lives as artists is a huge surprise ... so to get to this point where we're going to be 'Person of the Year' of such an important award ceremony is a big achievement. We were very inspired with the news." Maná, winner of six Latin Grammys and four Grammys, will be recognized for its achievements and contributions to the Latin community, as well as its constant support to the preservation and protection of the environment and human rights, the Latin academy announced Wednesday. Olvera, drummer Alex Gonzalez, guitarist Sergio Vallin and bass player Juan Calleros will be honored Nov. 14 at the Mandalay Bay Events Center in Las Vegas, where a variety of Latin stars will be performing some of the hits from Maná's repertoire, which includes Vivir Sin Aire, Cuando los Angeles Lloran and Rayando el Sol, among others. "Maná is an iconic band with a profound social and environmental consciousness that has created captivating and vibrant music for over three decades," said Gabriel Abaroa Jr., president and CEO of the Latin Recording Academy, in a statement. "Fusing mainly funk, reggae, ska, bolero and a spectrum of Latin rhythms mixed with pure rock, Maná has created true musical anthems." For over 30 years, Maná has used its voice to emphasize environmental, social, political and human rights issues through its songs, concerts and, more recently, social media. In 1996, the band created the Fundacion Ecologica Selva Negra, which works to preserve endangered species, offers educational programs on the environment, and contributes and organizes community development projects. Maná has promoted the Latino vote in the U.S. and Latin American and has denounced what it deems as social injustices in countries such as Venezuela, Nicaragua and Bolivia. He remembered that since Maná's beginnings in Guadalajara in the mid-'80s, he and his bandmates saw that rock 'n' rollers used their platform to promote a better world. "That's what John Lennon, or Bob Marley, or Bob Dylan did," Olvera said. As Person of the Year, Maná joins a group of past honorees that includes Marc Anthony, Placido Domingo, Gloria Estefan, Julio Iglesias, Ricky Martin, Carlos Santana, Alejandro Sanz and Shakira.